A TIME Magazine cover story has riled Thein Sein along with much of the nation. When the July issue of TIME Magazine hit newsstands it got the attention of the highest levels of government in Burma. On its cover is a serene image of Burmese Buddhist monk Ashin Wirathu, with a loaded phrase superimposed on his crimson robes: “The Face of Buddhist Terror”. 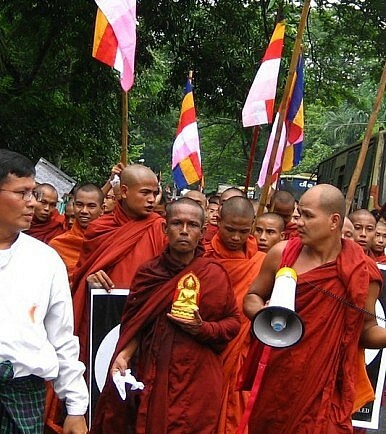 The article explores the rising wave of anti-Muslim violence in the country and traces much of it back to Wirathu. Reacting to the provocative story, President Thein Sein’s office released a statement that said the story “creates a misunderstanding of Buddhism.” It added, “The government is currently striving with religious leaders, political parties, media and the people to rid Myanmar [Burma] of unwanted conflicts.” Sein went on to call Wirathu a “noble person” who is a “son of Buddha”. While it may be true that conjoining the words “Buddhist” and “terror” may cast the vast majority of the world’s Buddhists in an unfair light, suggesting that real efforts are underway to cease sectarian violence and forge ethnic unity in Burma glosses over a number of troubling facts. Most significant among them: Wirathu actively encourages an extremist attitude towards Burma’s Muslims. This sentiment is not fringe either. As seen by the crowd, which numbered in the thousands, Wirathu has a massive following. Using an intoxicating mix of paranoia, racial stereotyping and unfounded claims, Wirathu has whipped up anti-Muslim sentiment among Burmese Buddhists. He can be seen here speaking at some length in these terms. An organic movement has formed as a result, which has come to be known as the 969 campaign. While most distance themselves from comparing the two, some have even likened the movement to a Burmese form of neo-Nazism. The numerological significance of the digits comes from the Buddhist idea that the Three Jewels (Tiratana) comprise 24 attributes: nine special attributes of the Lord Buddha, six core Buddhist teachings and the nine attributes of monkhood. Hence: 969. Burmese Muslims have their own numerological talisman as well: 786, referring to the Quranic phrase, “In the name of Allah, the Most Gracious, the Ever Merciful”, which has a numeric value of 786. The number is often seen plastered on the fronts of halal restaurants in Burma. The 969 Buddhists have struck back, putting stickers and signs that bear the number on shops, from food stalls and teashops to street vendors, to distinguish themselves as being Buddhist. There have been instances of Buddhists being beaten by 969 adherents for patronizing Muslim businesses. The numbers are a giveaway. While hundreds of Muslims have been jailed for involvement in the violence, very few Buddhists have wound up behind bars. Yet this does not end in the marketplace or with beatings. Beginning in the northern state of Arakan and fanning out to other parts of the country, over the past year hundreds, mostly Muslims, have been killed, while more than 125,000 have been displaced. Human Rights Watch (HRW) has called the Burmese government’s treatment of the nation’s Rohingya Muslim minority “ethnic cleansing”. Indeed, Burmese dissident Dr. Maung Zarni has listed a number of overt anti-Muslim acts committed by the government, from backing violence against Rohingyas and “cleansing” Muslims from the Burmese military to approving anti-Muslim publications and bolstering the rise of Wirathu himself. Even Burmese Nobel Peace laureate Aung San Suu Kyi was accused of remaining silent on the issue of the Rohingyas’ plight for too long until speaking out earlier this month against the controversial two-child policy applied solely to them. While Suu Kyi may have broken her silence when it came to this hotly contested official attempt at controlling Muslim numbers, she has not commented either way on Wirathu. While they may not be outspoken on the issue of violence against Burma’s Muslim minority, more than 59,000 have signed an online petition (as of Tuesday afternoon) to protest TIME’s cover story on the grounds that it misrepresents Buddhism – but not necessarily in defense of Wirathu’s views. While it remains to be seen what will become of the contentious issue of the magazine in Burma, presidential spokesperson Ye Htut said that, unsurprisingly, the Burmese government might just pull it from circulation and remove it from the public’s view.